Three Out of Four Ain't Bad | American McCarver. Your Sports Blog. So the return visit of the Phillies to San Francisco didn’t produce as much tension as the series in Philly, unless you could two tight well-pitched games and a brawl during a blowout. Okay, so maybe it did produce tension: but only the last two games produced taut games with lots of non-fisticuff-related drama. At least the Giants avoided the ignominy of the four-game sweep, and at home, no less. It’s pretty hard to sweep a four-game series anywhere, as most knowledgeable fans will tell you. 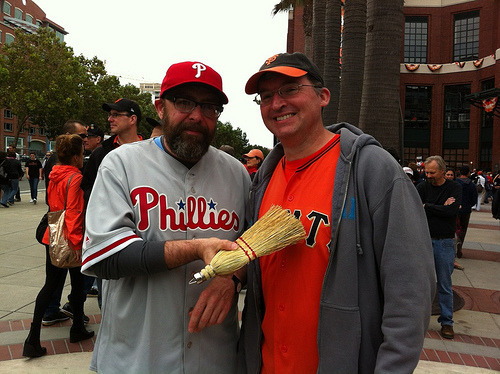 Still, some Phillies fans had hope, given how inept the Giants have looked all week. In the end, Sunday’s game was a taut 3-1 affair in which the Giants needed three hits to plate a runner who had hit a leadoff double. I’ve never seen that before, but if any team can generate a negative offense, it’s my Giants. My favorite bit of Giants-Phillies trivia: Tim Lincecum is the last two pitchers to have beaten the Phillies. And he lost a game in between those starts!